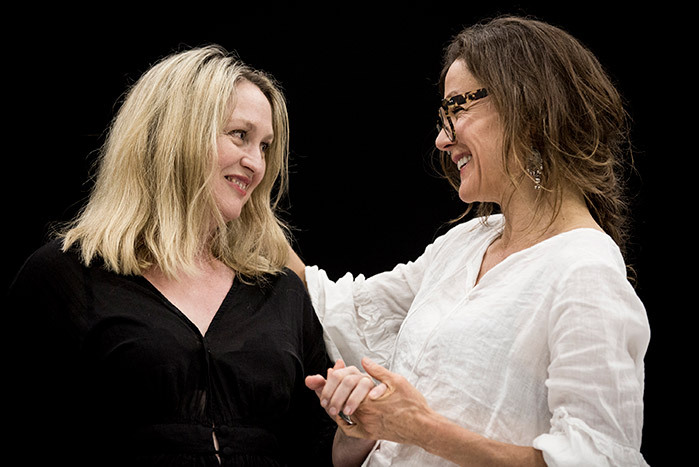 As adapter of STC's 2019 production of Mary Stuart, award-winning playwright, screenwriter and actor Kate Mulvany (Harp in the South) discusses Queen Elizabeth and Mary Stuart's fascinating true stories, how she incorporated those stories into her characters, and the profound importance of women in power supporting each other. Society says there is not enough room for one powerful woman in this world, let alone two. Kate Mulvany says - enough of that. Watch this short video before reading the full interview below. Let’s begin where you did – with the research. How did you approach the mountain of material out there on Elizabeth I and Mary Queen of Scots, and were your opinions changed by your findings? The first thing I did was read the [Friedrich] Schiller, which was the original play written a couple of hundred years ago about Elizabeth and Mary, and that gave a good foundation. I then read many other translations and adaptations, and the thing that struck me about all of the interpretations I got my hands on is that they were all written by white, European men. And yet this is the story of two incredible women – who were kind of the original feminists; they had modern feminist ideals, three hundred and fifty years ago. So I decided that, unlike the other plays, I didn’t want these women to be pawns in a chess game played by men, I wanted them to be the chess masters. That was my first beginning. Then I researched everything I could: not just about Elizabeth and Mary, but every other person in their lives, even if it was just a servant, or a lover they’d had when they were really young, or someone that had really influenced them, preferably a woman. I read the trashy stuff, and the really high-brow stuff that was a bit over my head, and I took in everything I could before filtering it out, thinking, ‘I’m interested in that part of her story, and that jigsaws well with that part of her story,’ and so on. It became a psychological exploration of why these women were the way they were, and how they expressed that in the context of an incredibly patriarchal society. Do you find it easy to connect with these women? Or do their decisions sometimes feel alien to the modern mind? No! The whole time I could understand exactly why they acted as they did. When you look into the history of Mary Queen of Scots, for example, it was traumatic. She suffered some incredible cruelty. She was ground into the dirt, quite literally sometimes, but she just kept getting up again. For her to keep rising, like a phoenix, was incredible, but it didn’t surprise me because she’s a woman trying to survive. With Elizabeth it’s very similar, she had to constantly worry about invasion. It’s little surprise to me that she claimed herself the Virgin Queen, because she was not going to let anyone invade her – physically, emotionally or geographically. Knowing that Elizabeth was the daughter of Henry VIII, that she watched her own father slaughter women, you can see why she puts up this incredible shield. As a result, the decisions don’t confuse me; they make complete sense and, in fact, break my heart. When you’re writing a story that is already part of history, how do you approach the challenge that most audience members already know so much of its main characters? How do you keep them engaged in, and surprised by, each scene? You have to give them an alternative, find a way in that is different from the interpretations we’ve already had. As far as I know there has been no other female translator of this play, so that’s a different insight already. But I also write for the actors that I have: the amazing Caroline Brazier and Helen Thomson. When you know that you’ve got them on board, Lee Lewis as director, and the rest of the cast and creatives, you can take certain pathways. I like to make my plays very funny, so that we can all have a good laugh and fall in love with these characters, before we rip the carpet out from everyone. We take the audience from highs to lows – there’s no even ground here. But you also have to contend with the amazing performances over time of these characters, from Helen Mirren to Cate Blanchett, Saoirse Ronan and Margot Robbie. I love their performances, but I have to get them out of my head, because they’re not my queens. We have to build them from scratch, and that comes from really, really intensive research, finding those personality quirks that may not have popped out to someone else. For example, Queen Elizabeth wrote this amazing poem about a pug once, it really made me laugh. She liked poetry, she revived the arts in her time, and she also had a wicked sense of humour. Or the fact that Mary lived with sexual abandon. I love that, even in that time, she was so proud of herself and her body and what she could bring to a sexual relationship. That’s something to bring out: her sexuality, vibrancy and verve. It’s important to me that the audience doesn’t sit before a very formalised court, because we have seen that before. And in fact, it wasn’t exactly truthful. The fact that people did swear, for example. We get some of our most delicious swear words from Elizabethan England, so why not hear them on the stage? It’s not there to be offensive, it’s there because the language was in use. When you put those thoughts and language into the mouths of queens, it becomes naughty and dangerous and real – especially when those words are accompanied by the incredible outfits that we have on stage, designed by Mel Page. You will get the full Gloriana of Queen Elizabeth, with the body, heart and mind of a queen, but also something kind of informal. I love that clash, because it makes them more human. In terms of Elizabeth Gadsby’s amazing set design, it’s like a floating island ­– which is really what these two women were arguing about. It’s simple and elegant, with very few props but many levels, and when you see Lee Lewis’ amazing direction at work with the men also on stage, it’s like you are witnessing a living, breathing chess game. It’s fabulous to watch. A lot of the movement originates from that beautiful brain of Elizabeth’s: if she’s not getting the information she needs from one of her men, she’s going to move across the stage to seek it from someone else. There’s also a wonderful little dance break that is – without spoiling too much – worth the ticket alone. Whether it’s historians or a friend across a coffee table, when people discuss these women they inevitably fall into Team Elizabeth or Team Mary. Does it need to be this way? Do you feel this way? Now this is something that’s really fascinating. It doesn’t surprise me – it bemuses me. The other day I was standing in a queue at Woolworths and looked at a magazine in the rack that read, “Kate vs. Meghan”. And that headline happened every time [Prince] Harry got a new girlfriend. You don’t see: “Charles vs. Andrew”, but we saw “Diana vs. Fergie” and, in my mum’s era, “Elizabeth vs. Margaret”. These women need each other. They’re living this crazy life, and for some reason our society says that there is not enough room for one powerful woman, let alone two, so we’re going to drive them apart. The truth is no one knows what those women are going through, so they should be allowed to be. I get quite emotional about this – just let them be! Let them live the life that the universe has put them in and don’t make this the woman-bashing competition that we’ve done over and over throughout history. Mary and Elizabeth were not allowed to be friends, even though they did everything they could early in life to be friends. They wrote letters to each other, they were pen pals, they had nicknames for each other, they loved each other, they had the same blood running through their veins and royal hearts. They were born queens, they didn’t marry into it, so they had so much to talk about, to share and to advise each other on. Instead they were made fearful of each other. As a modern writer to a modern audience I want to say, enough of that. Absolutely. I’m so proud of these women because they were some of the first to form the pathway for us. They knew how they were supposed to be spoken to; they knew they deserved their place in the world. We are long way down that pathway now, but we’ve got a long way to go. Both men and women have to keep paving that queenly pathway. Seeing the show? Pick up a souvenir play program from the Roslyn Packer Theatre foyer for $12, featuring in-depth articles, photographs and info about cast and creatives. You can pre-purchase program vouchers for $11 when booking your tickets. Season Ticket Holders can pre-purchase vouchers for $10 with their Season Ticket.